NJIT architectual student Ahmed Emara gave me the official tour of the house. Listen to my podcast tour with him. As he gave me the tour, he explained that the concepts of longevity, energy efficiency, and low maintenance were central themes to the home. I absolutely love their animated video about the house. 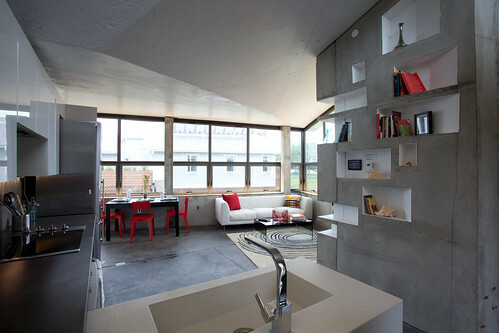 In addition to explaining the components of the house, it shows how people could live there. The team incorporated concrete everywhere. Concrete floors. Concrete countertops. You name it. Concrete. Right out of the Flintstones except instead of bedrock…concrete. I was a little disturbed with the amount of concrete from a design and environmental stand point. Concrete is a high embodied energy product to make. I questioned Emara about why ICF versus other structural forms such as structured insulated forms (SIP.) He explained that the team chose ICFs due to their long life and high thermal value resulting in super energy efficiency. In addition, low maintenance was a key element of the structure. Mold and termites were a non-issue with this house. In fact, their home will be standing a 100 years from now. As for marketability, in my opinion, the house is quite cold and not aesthetically pleasing. The team did include strategically placed pops of red in the space to give it a warmer feel. I gave the team an A+ for their guided tour and website. Many of the other teams let you wandered and expected you to question them. In addition, their website is quite detailed about the engineering and architectural design of the structure. As I mentioned above, their animated video of the house was superb. Unfortunately, the Team placed second to last in the competition. They scored low in many of the categories. Despite its placement at the Solar Decathlon competition, Team New Jersey created a unique home. They were the only team that I saw that used concrete as a medium for its structure. Hang on to your green building loving hats since there are more team solar house coverage to come on Green Talk. 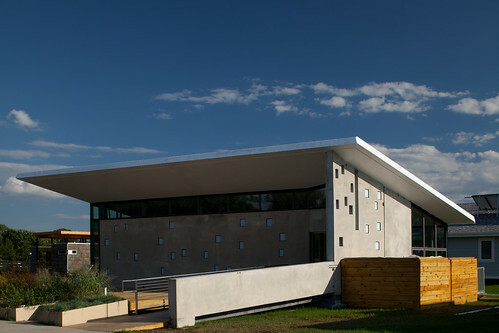 Just to wet your appetite, many of the teams incorporated such green building elements as phase change materials, ultra efficient solar panels, and green roofs with design twists unique to each home. What do you think of the ENJOY House’s design? Cold or Hip? How do you feel about the use of ICFs and concrete facade? Environmental nightmare or energy efficiency dream? What advise would you give Team New Jersey? Anna, I saw your “Team NJ” tweet come out via @greenmoms and knew it was you! Agree with you that concrete for a home = cold, and no doubt other women would agree. Architects should consider that re marketability. Also thought of all the issues with concrete plants and pollution. From the outside, the house looks like any other uniquely designed apartment. It does not look like it has been modified with energy efficiency in mind. However, the inside of the house should be quite a impressive view.